Before heading out on my holiday vacation last month, I was invited to The Mercury Lounge to feast my ears upon the music of Venice, California-based band, Faulkner. While I was initially intrigued by front man, Lucas Asher’s, eye-catching black wings and what promised to be a legitimate stage show, I unfortunately found myself rather disappointed a few moments into the performance. A self-proclaimed duo “kinda like MGMT,” Asher and his producer/keyboardist/multi-instrumentalist, Eric Scullen, work together to create the band’s sound and compose each song they bring to the stage. Asher describes their sound as inspired by David Bowie, The Clash, and Bob Dylan. Despite drawing influence from some of the greatest names in music history, Asher, Scullen and their fellow musicians aren’t quite able to make their collaboration work. Separated, Scullen certainly has an ear for production and a gift at the keyboard, but the band lacks harmony in their vocals and depth and sincerity in their lyrics. Asher admits that the band has only been together for about a year and has made what seems to be great strides with some big names in the music industry. 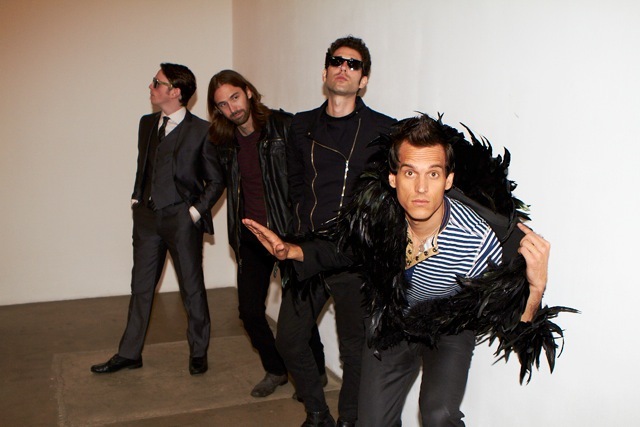 The band’s first EP was produced with the minds behind The Killers’ Hot Fuss (Mark Needham) as well as The Strokes’ This Is It (JP Bowersock), who also joined them onstage after hearing the band’s track, “Stoned” on Soundcloud and reaching out to them. Faulkner’s fate seems hopeful at the very least with the help of such powerful people, and Bowersock seems to be a big fan of the guys. Perhaps with feedback and coaching from some of the best, Faulkner can tighten their sound to produce vocals and a concurrent melody that match Scullen’s original synth tracks, as this is where the band’s strength seems to lie. According to Asher, Faulkner will be releasing their album in the first quarter of this year and planning a tour to accompany the release. It’s safe to assume we can expect the band back in New York, and perhaps after a few more months of practice we’ll be in for somewhat of a live show.